Very fun card with all those gorgeous CP inks! Thanks for joining us at CAS-ual Fridays. What a fabulous and fun card! 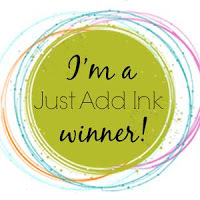 Love the rainbow stamping with those amazing inks!! Thanks for playing along with the CAS-ual Fridays Challenge, so glad you joined us!! Love your fun and colorful card! It looks great with the rainbow of colors. So glad you could play along with us at the CAS-ual Fridays Challenge.